While the prestige of this year's North American International Auto Show was somewhat diminished by the poor financial condition of the auto industry, there was a strong showing for the state-of-the-art in dashboard user interfaces. Automobile manufacturers are frequently leaders at bring new technology to mainstream consumers (e.g. satellite radio, GPS), so it seems like it's time the industry caught up to the rapidly changing field of interface design. Drivers accustomed to receiving vehicle information from familiar needle-and-dial gauges will soon benefit from the work automakers are doing to create information systems that are more flexible and take advantage of the latest developments in computer displays. I'm all for adapting interfaces to drivers' needs, but hope that the customization is limited to effective information displays that support visibility and reaction time. 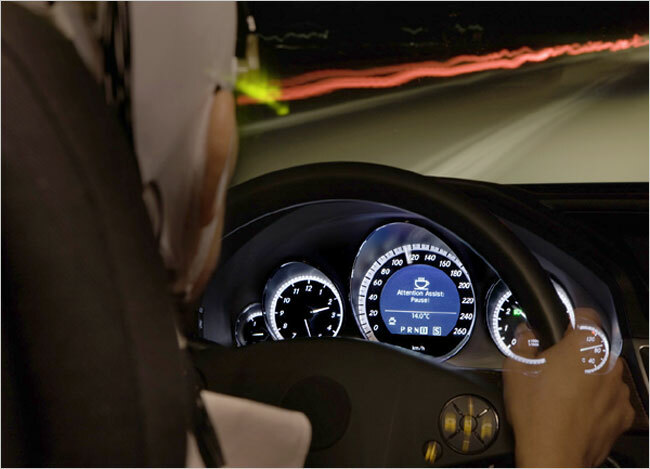 Of particular note was a system demonstrated by Mercedes, which uses an array of driving behavior sensors to "sense" if the driver may be inattentive or drowsy, and displays a coffee cup warning light (pictured above). Nissan is also working on a design called “Eco-Pedal” that uses chip sensors to determine when excessive throttle is causing poor fuel mileage, triggering a push-back mechanism on the driver’s foot. Volvo’s “City Safety” system uses radar technology to sense imminent collisions at speeds between nine and 18 mph, and it automatically applies the brakes when closing speeds are too high.